Some undergraduate students in Nsukka, on Thursday appealed to the Federal Government (FG) and the Academic Staff Union of Universities (ASUU) to shift grounds in order to resolve their issues. The students told news men in separate interviews that they were tired of staying at home following the nationwide ASUU strike. ASUU had embarked on the strike on Nov. 4, 2018 over FG’s alleged inability to fulfill the agreements signed with the union in 2009. Charles Odoko from the Department of Economics, University of Nigeria, Nsukka, urged relevant stakeholders in the country to intervene and prevail on ASUU and government to reach a compromise so that the strike would be called off. “I am pleading with the relevant stakeholders in the country to intervene and end the ongoing industrial action by university lecturers in the interest of students. “I am also pleading with the FG and the lecturers to resolve their issues; I am tired of staying at home I want to go back to school this January. “The FG should urgently meet the demands of ASUU as the constant strikes by lecturers are affecting the quality of tertiary education in the country,” he said. Jane Ukaegbu, of the Department of Political Science at the University of Lagos, said that government and ASUU should consider the future of students and place that above other interests by resolving the dispute. “The FG should always try to give priority to issues concerning education since the level of development of any country is anchored on quality education. “Government should also strive to respect any agreement reached with ASUU as the current strike was due to government’s inability to fulfill the agreements it reached with the union since 2009. 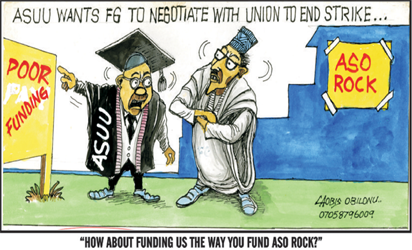 “I am urging the FG and the ASUU to reach a compromise so that students can return to school,’’ Ukaegbu said. Kenneth Amadi from the Department of Psychology, University of Port Harcourt, said the frequent strikes by public universities’ employees were altering the academic calendar and distorting students’ set time of graduation. “Today ASUU is on nationwide strike, tomorrow it would be non-academic staff; this is why top government officials send their children to private and foreign institutions and could not care less about the ASUU strike.